Our relationships with some of the best real ale and craft beer breweries in the country are an element of The Beach House that we’re particularly proud of. Recently, we introduced Adnams beer in Worthing, and it’s safe to say it’s gone down a storm. One of the breweries supplying several of these tasty new brews is Adnams. Most famous for brewing beer in the seaside Suffolk town of Southwold since 1872, Adnams have won countless awards not only for their beer, but their gin and vodka too. They work with local farmers and producers, as well as partnering with overseas beer brands (and two of our favourites) Bitburger and Benediktiner, to bring their delicious brews to the UK. 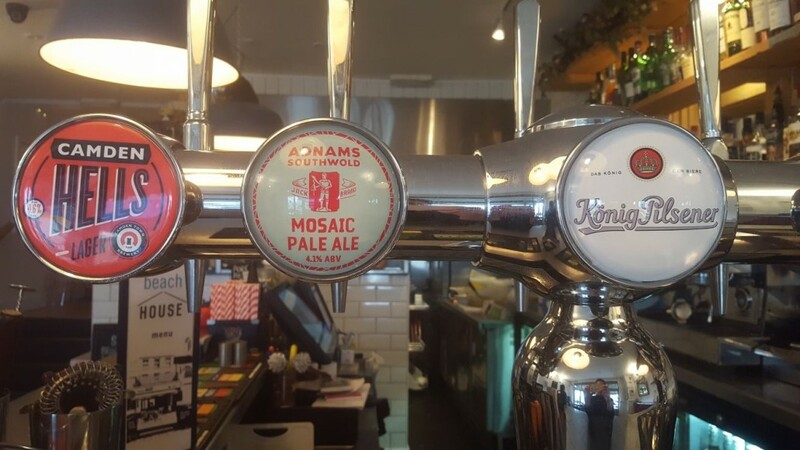 Jack Brand Mosaic Pale Ale is a brand new beer we’ve recently put on tap – a self confessed ‘fruity one-hop wonder’, we’ve got it on keg and it goes perfectly with lightly spiced dishes, as well as scallops! It’s made with mosaic hops, and features mango, peach, lemon and pine flavours.